This January we shared an update on Landmark and Mogul buildings, special architecture within Titan City that help tell its story. We mentioned that in 2019 we would ramp-up development of Mogul buildings. We have indeed been hard at work getting these buildings designed and today we will share progress with you! Moguls were part of our Kickstarter campaign and they will create unique ‘micro-environments’ of Titan City’s world. Each Mogul is being developed as a community project in collaboration with a Kickstarter contributor. If you are a Mogul contributor and have changed email addresses, please notify us so that we can stay in touch with you. We have decided to share this update as if you were walking through the Old Bradford neighborhood. This way you will not only see the models, but also understand how they are related. The tour will be given in three parts, each week focusing on a different area of the hood. Today, we explore the Scholarton District. As you look at the map of Old Bradford above, this tour will start from the upper/left side. If you were to walk from Alexandria into Old Bradford, the first area you would encounter is the Scholarton District in the North West. Scholarton is an area of old residences – mostly Victorian houses that managed to survive the 1908 fire. In parts that were not burnt to the ground, the original streets still survive. Much of Old Bradford was rebuilt after the fire with cheap housing for displaced workers and families, until something better could be found. As time passed, people began to move out and artists and university students started to fill the vacancies to gradually make the district theirs. Old Bradford soon became a neighborhood of poets and musicians, painters, thespians and pulp writers, all struggling to make ends meet while practicing their crafts and passions. 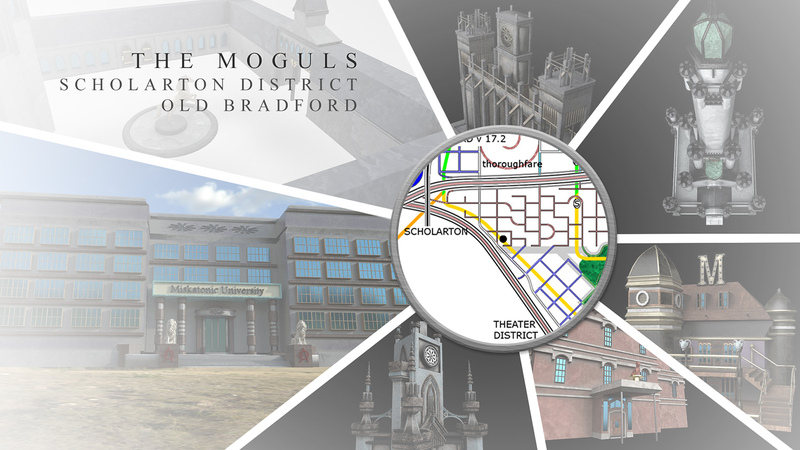 Several mogul concepts shared by participants in our Kickstarter campaign fit nicely with the Scholarton District and will be placed there. The map below shows the general area where those moguls will be placed – the Scholarton District. Tucked away in a shadowy corner of Scholarton lies one of Titan City’s best hidden gems, Madame Meagor’s Macabre Museum. While not as large as some of the institutions in Alexandria’s Museum Row, Madame Meagor’s holds some of the most interesting dark artifacts to be found in Titan City. Like the Museum of Death in Hollywood, or the Torture Museum in London, the Macabre Museum is a cult favorite. It’s not just a place to check out Goth costumes. For villains and heroes who practice mystic arts, it contains many old books and relics for ancient rituals and spells. Most Titan City heroes are familiar with the Ivy-League University they first encounter in Alexandria, Ephesus University (EU). But it’s not the only game in town. Miskatonic University in Scholarton is a smaller, prestigious university that serves as a great alternative. Miskatonic has architecture common to schools throughout New England. The lions in front represent universities fallen throughout the U.S. during modern super hero battles. It is a school for those who miss their home world, and a place for independent thinkers who are looking for literature like H.P. Lovecraft, with his explorations of anarchy and chaos. Heading towards Byrne Park lies another historic Titan City institution: The Aegis Club. This old Victorian mansion with its courtyards and stables is another survivor of the 1908 fire and is home to the prestigious Aegis organization. The equestrian statue in the courtyard has become a regular meeting spot for Satyrs, Nymphs and Faeries who practice magic with teams of like-minded folk in Byrne Park. While the stables are used by the public for renting horses, the Aegis Club runs most activities hidden from public view inside its large mansion. Occasionally you may catch one of the members heading out behind the building near the circular tower and can ask them details about the club. Deep in the maze of Scholarton’s old architecture looms another striking building – Dante Tower. This building withstood the 1908 fire and towers over Scholarton with stone arches at its foot, gothic bell towers and spires reaching upward to the sky. Arched doorways allow access to the building, but it’s a mystery who actually enters and tends to this beautiful relic of Scholarton. Note: Dante Tower is a structure that has been built with some flexibility for the Titan City game team to place over a road, water way, as a bridge between two buildings, or as a stand-alone tower. We will explore how it looks in the game environment to find the most striking setting for this unique building. All Critters Micro and Mega Veterinary Service (ACMAM) is an animal hospital catering to all critters, regardless of size or shape. It is perfectly suited for Titan’s City’s amorphous population. Cats, dogs, birds, fish and the expected critters of any city can find care here. But mutant binary creatures, over-sized fur-balls, and dragon-related gorgons of every kind can also find the specialized care they need here - Care that probably can’t be found in any other institution in the United States. We shared this mogul with you in our January update and we think it’s one of our most intriguing. A gothic tower inspired by the Water Scott Memorial in Edinburgh, Scotland, it will be located in the heart of the Scholarton maze of old buildings, near Bryne Park where it will offer a dark, inspiring place to scout for mystic mischief in one of Titan City’s oldest neighborhoods! The last stop on this week’s tour through Old Bradford will be at the Hippocrene Towers, just outside Scholarton, near Byrne Park. While it is technically in the New Bradford area, it’s an older structure that shares more of its aesthetic with the buildings in Scholarton than the more modern style of New Bradford. This moderate-sized tower with a fairly small footprint is a historic structure reminiscent of the Chicago Water Tower. Made of concrete, it was one of Titan City’s older buildings that withstood the Great Fire of 1908. At its’ base is a water fountain for tossing coins and making wishes, and the old concrete spires were built decades ago to resemble the motion of water rising into the air. The Hippocrene Towers which stood through the City fires has come to represent the resilience of the many residents of this community who rebuilt their home after fire and devastation, making something even greater when faced with challenges, to build a new Titan City! Next Week we will continue our stroll through Old Bradford visiting newly-made models of other moguls in the neighborhood, heading into a modern, trendy part of town – New Bradford! Special thanks to Nathan Purkiss (AKA Red Warlock) for 3D modeling the buildings featured in this update.